For enrolment in Kindergarten, your child must be four-years-old by the end of the calendar year. The English Program is exclusively in English. Core French instruction is introduced in Grade 4. In the Core French Program, students learn basic French through songs, games, drama, and interactive activities for a specified period of time daily. 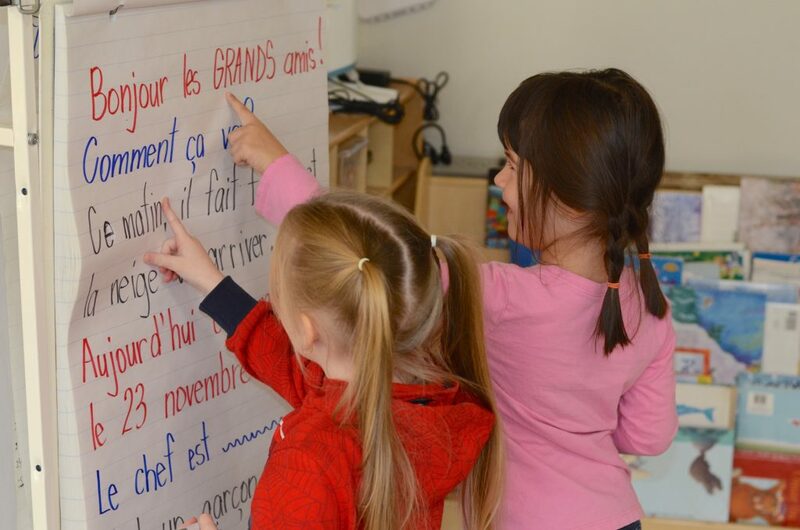 French Immersion immerses children in the French language, including cultural experiences, when they begin school. English language instruction is introduced in Grade 3 and gradually builds to an equal balance of French and English instruction by Grade 5. This ensures that students gain effective bilingual skills. This program is designed for English speaking parents/guardians so they may support their child to become bilingual. All Rainbow Schools will offer an orientation for children who are starting Kindergarten. At the orientation, families will connect with teachers, early childhood educators, school personnel and staff from community agencies. Kindergarten is offered in Rainbow elementary schools in English and French Immersion. Rainbow District School Board’s Kindergarten program is based on sound principles of early childhood education with a strong focus on character development. Intellectual stimulation, physical development, social/emotional development and self-discipline are emphasized daily. In Rainbow Schools, children learn important values such as sharing and co-operating with others. Teachers become important role models for the young children, which further enhances the learning experience. In Rainbow Schools, children are immersed in a rich learning environment where their social, emotional, physical and cognitive growth are nurtured through play-based learning. Children play at learning centres where they are encouraged to explore and solve problems in groups or on their own. Children use a variety of material to discover, investigate how things work, share ideas, develop theories and test them out. With a teacher and an early childhood educator in every classroom, adults will have greater opportunities to get to know your child. This team approach will bring out the best in your child through activities and play. There will be a more relaxed entry for four-year-olds into the school environment. There are four and five-year-olds in the same class, so older students can model routines. Children will have an opportunity to get to know each other and learn alongside their peers, both younger and older. Play-based learning will be the primary method of instruction, although short blocks of direct instruction are required for some essential skills. Children will have many opportunities to engage in activities using materials that are meaningful and relevant to them. A timetable will be developed to channel the energy of young children. The day will include active times both inside and outside, quiet times listening to music and enjoying stories and books, and plenty of opportunities to play. Children will explore, experiment and problem solve. They will use natural materials, to dramatize, paint, draw, design, sing, dance and laugh. A strong foundation for future learning in literacy, numeracy, science, social studies, the arts, health and physical education will be provided in a program that celebrates children and the joys of childhood. Learn more by clicking in the links below. Rainbow Schools are pleased to offer licensed, not-for-profit child care services, ensuring seamless, affordable, quality care and continuity for families with school-aged and preschool children. For a full list of child care providers in Rainbow Schools, please click the link below. What is all day early learning for four and five-year-olds? All day early learning is a curriculum-based program. Four and five-year-olds will attend school all day, every day. There will be two adults in each classroom of approximately 26 students – a teacher and an early childhood educator. Through instruction and play-based learning, children will develop socially and emotionally by interacting with their peers and the adults who teach and guide them. They will also develop their capacity in language and mathematics, and participate in physical activities and the arts. How will all day early learning benefit my child? All day early learning offers children a high quality program that provides a sound start for a healthy and productive life. They have increased opportunities to be with their peers and to develop the academic and social skills necessary for school. The program builds a solid foundation for each child’s reading, writing and math skills. Busing is offered for four and five-year-olds, based on Board policy through the Sudbury Student Services Consortium. To see if your child is eligible for busing, please contact the Consortium at 705.521.1234 or 1.877.225.1196. Transportation for the before and after school programs are not provided. The program is the same, however, the language of instruction is French. 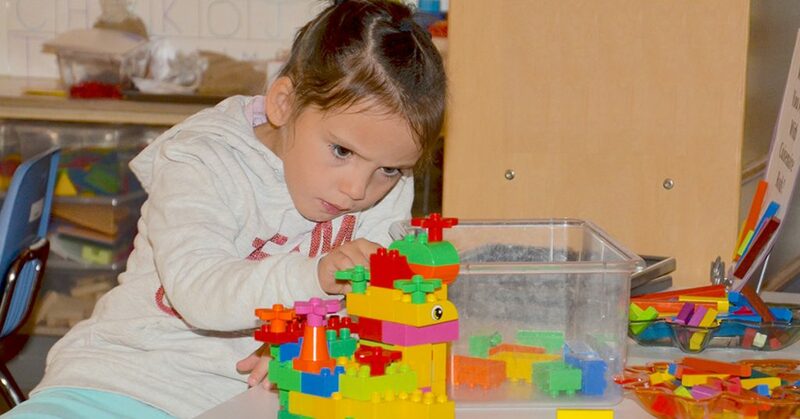 What does French Immersion look like in the play-based classroom environment? Large blocks of time are dedicated each day to play based learning and inquiry, both indoors and outdoors. The play is rich and driven by children’s interests, so children are highly engaged in their play-based environment. Small group learning throughout the day creates a great environment for learning that gives the educator the opportunity to work more closely with the children focusing on their learning strengths. Materials are important in Kindergarten and assist with building the language experience. Educators sit with the children as they are using the various materials and talk about their learning and thinking with them in French. For example, a child might use English words to explain his thinking or share his ideas. The educator responds by reflecting his thinking back to him in French by highlighting key words with actions, further probing the child’s thinking by asking questions and / or elaborating in French by suggesting other possibilities. In this way, the educator is verbally responding, extending and challenging children’s thinking. Children are immersed in a meaningful French print environment that children and educators build together through daily inquiries and investigations. Together, they create and read French texts and appropriate French print. The language of the classroom is vibrant and energetic, arising from the interests, questions and thinking of children as they interact with the world and the people around them. Children hear the French conversations that occur between the educators. Children can be heard speaking French in the hallways and on the playground. They incorporate French words, phrases and expressions into their conversations. Educators are co-learners with the children. They are responsive to children’s interests and children’s questions. Educators spend time observing children’s play in order to develop deeper understandings of children’s thinking and learning. Educators spend lots of time talking with children about the materials they are using. The program, projects and studies are authentic and emerge from the children’s interests that are expressed and repeated over time. Educators immerse children in the language of French, by speaking to each other in French, and by speaking to the children in French. Educators model rather than correct children’s attempts to speak in French. While children continue to express themselves in English, educators speak French. Educators will be sensitive to children who may be frustrated or upset and require some English supports in order to engage in learning early on in the first year of the program. Language acquisition is enhanced through effective second language teaching practices such as through gestures, body language, expressive tone, visual support, repetition, songs, rhyming games, short stories and play acting, that help children develop the French language, as well as the other expectations of Kindergarten. Children and educators create and use actions to go along with the vocabulary to engage all learning modalities (kinesthetic, visual, auditory). French songs and poems that are related to the interests and projects going on in the classroom expand children’s understanding and help them acquire language in different ways. Songs and poems recorded as print provide another way for children to see the written French language. What is the role of the children? In a play-based environment, children are given choice and opportunity to be active participants in the design of their learning. Young children acquire language when given the opportunity to be actively engaged, in their learning and to question, to offer ideas and share what they are discovering. Children want to learn words, phrases, descriptions, questions, explanations and narratives that relate to their play and the interests they are pursuing and are more motivated to use French when it relates to their interests. Children are comfortable playing with the French language. They will use a combination of French and English in their conversations with one another and with the educators. Children develop increasing confidence as they begin to recognize words and phrases and start using them. Children’s receptive language skills (listening / reading) develop more quickly than their expressive language skills (speaking / writing). Therefore, although the French Immersion educators will be speaking French, the child’s ability to respond in French will gradually increase as they are immersed in the language. Children will be comfortable using the French they know. There isn’t anxiety around “having to speak French”. There is a context to the vocabulary because it is based on the projects and activities that the children are creating. The children will use the words because they want to engage in the play with their peers and educators. Children are happy and confident and comfortable in French Immersion. They know that they can learn at their own pace and that their interests are valued. Why the new classroom design?